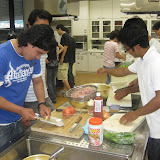 We had a cooking party on 9th Jul. and　cooked　Nepalese,Chinese,Vietnamese and Korean food together. Which one is the best dish on the party? ?